Adrian Juarez, maybe the most active artist on Mahorka (and certainly one of the most active in the contemporary music) did his second take twisting the Mahorka back catalogue through his artistic view. 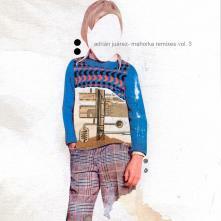 The result is third in the series "Mahorka Remixed" (the first volume being by Adrian too!). On this another 16 tracks he worked on/with he has taken a more beaty and melody oriented way, compared to the more ambient sound of last time. Again we have is decision of exactly 2 minute lasting compositions, not mixed one into another, but flowing really well as a whole listening trip to experience. Ah, and we have Mahorka label manager contributing some clicky clattering techy sound to the Baikonour's "Cool as a chess party.." remix. Enjoy!